New York State Department of Environmental Conservation (DEC) today reminded visitors to the Kaaterskill Wild Forest in the Catskill Forest Preserve, Greene County, to follow designated trails and obey posted signs after recent accidents at Kaaterskill Falls. In November, DEC completed numerous safety and public access improvements at the popular Kaaterskill Falls. The projects are all part of a comprehensive effort to make the Kaaterskill Wild Forest area a safer and more enjoyable destination to visit. DEC also announced the completion of $750,000 safety improvements at the Wild Forest. In November, DEC completed the installation of a 115-foot hiking bridge spanning Spruce Creek and connecting the hamlet of Haines Falls to the Escarpment trail and North/South Lake campground. The bridge is part of a new 1.8-mile trail connection between Haines Falls and the existing trail system in the Kaaterskill Wild Forest and North/South Lake campground, which DEC completed with the assistance of the Kaaterskill Rail Trail Committee. This past summer, DEC contractors completed a new foot trail leading from the end of the marked Kaaterskill Falls trail at the base of the falls upslope to the middle pool of the falls, which included installation of a new stone staircase. The 200-step stone staircase was designed to blend in with the natural stone of the area at a location that limits its visibility from below. The staircase contractor, a professional trail crew from the Adirondack Mountain Club, built the staircase by hand using an elaborate cable system and ramps to move each of the 700-pound stone steps from a staging area on the opposite side of the falls. The trail was also extended from the middle pool to the Escarpment trail creating a key linkage between the top and the bottom of the falls, allowing hikers to avoid a potentially dangerous bushwhack between the two locations. Earlier this year, DEC expanded two nearby DEC-managed parking areas, the Laurel House Road parking area and the Schutt Road parking area. Both lots were expanded to accommodate approximately 35 cars each, almost tripling the previous amount of available parking spaces. In the fall of 2015, DEC completed a fully accessible trail leading to a new accessible overlook platform at the top of the falls. These features improve the public’s view of the falls from the top and enhance safety by directing people to a safe viewing area away from the top of the falls, where people have fallen. In the fall of 2014, DEC installed about 500 feet of split rail fencing at both the upper and lower falls. The fencing serves as both a physical and visual barrier to alert the public to the potential dangers of proceeding further. Additional signage was also installed in more conspicuous locations to warn the public about the potential dangers in the area. 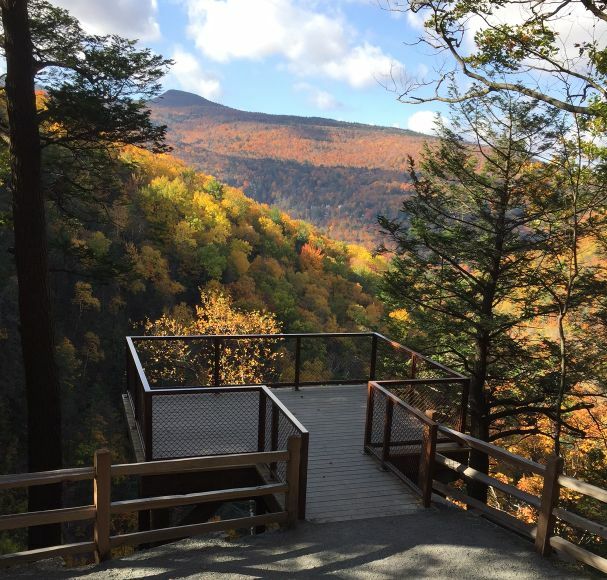 The new trails, bridge, viewing platform and stone staircase address the public’s desire for access to a better view of Kaaterskill Falls and the middle pool area, while enhancing public safety. The projects were funded by $750,000 primarily from the NY Works program. Through Governor Cuomo’s NY Open for Fishing and Hunting Initiative, an effort to improve recreational opportunities and boost tourism activities throughout the state, the state has invested $10 million in NY Works funding to infrastructure repairs at fish hatcheries and 50 new land and water access projects such as boat launches, hunting blinds, hiking trails, and parking areas. This story is a press release issued by NYS Department of Environmental Conservation. It was not written or edited by the Watershed Post. If you are affiliated with a local government agency or community organization in the Catskills, and would like us to consider publishing your press releases, please email us at editor@watershedpost.com..